- Publisher This book examines current andfuture issues facing older peopleand the church. Combining currentgerontological thinking theologicalinsight and practical applicationRob Merchant offers a startingpoint from which to map out theterritory of this new landscape ofolder people. Whether young orold church minister or member thisinvaluable resource will surpriseprovoke and spark debate onthe mission and composition ofthe church across generations astogether we pioneer the Third Age. - Publisher The 'Third Age' is transforming the economic, political and technological landscape around us. Its affects are being felt by governments and agencies, within families and marriages, and between generations. Whilst many have recognised the vast spiritual implications of these changes and the need to recover the value of older age, little has been done to restore the biblical picture. Churches have not pioneered the Third Age. Pioneering the Third Age examines current and future issues facing older people and the church. Combining current gerontological thinking, theological insight and practical application, Rob Merchant offers a starting point from which to map out the territory of this new landscape of older people. Whether young or old, church minister or member, this invaluable resource will surprise, provoke and spark debate on the mission and composition of the church across generations, as together we pioneer the Third Age. 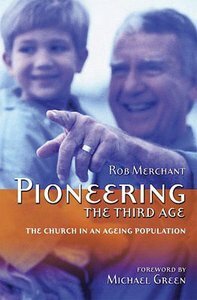 About "Pioneering the Third Age"
This book examines current andfuture issues facing older peopleand the church. Combining currentgerontological thinking theologicalinsight and practical applicationRob Merchant offers a startingpoint from which to map out theterritory of this new landscape ofolder people. Whether young orold church minister or member thisinvaluable resource will surpriseprovoke and spark debate onthe mission and composition ofthe church across generations astogether we pioneer the Third Age. The 'Third Age' is transforming the economic, political and technological landscape around us. Its affects are being felt by governments and agencies, within families and marriages, and between generations. Whilst many have recognised the vast spiritual implications of these changes and the need to recover the value of older age, little has been done to restore the biblical picture. Churches have not pioneered the Third Age. Pioneering the Third Age examines current and future issues facing older people and the church. Combining current gerontological thinking, theological insight and practical application, Rob Merchant offers a starting point from which to map out the territory of this new landscape of older people. Whether young or old, church minister or member, this invaluable resource will surprise, provoke and spark debate on the mission and composition of the church across generations, as together we pioneer the Third Age.